Fantasy owners, the time has come, Yu Darvish will be making his season debut on Saturday against the Pittsburgh Pirates. Darvish is returning after 22 months of rehab following Tommy John Surgery. 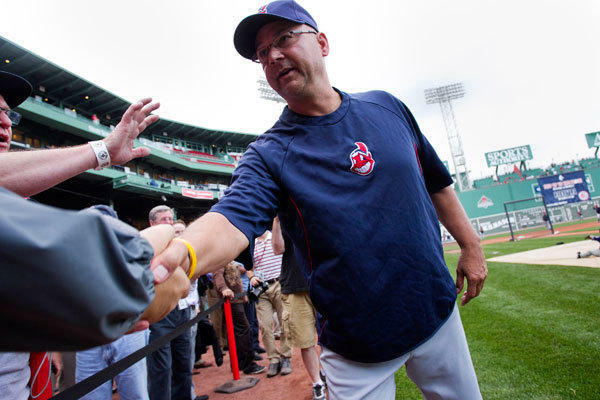 He has made five rehab starts in the minor leagues and he has been very sharp. In those five starts, he has thrown 20 innings, with a 0.90 ERA, and 21 strikeouts. He has also hit 97 MPH with his fastball, which is a great sign of positive health. It looks like Darvish is back and ready to dominate for the Texas Rangers. What Is Taking So Long With The Angels And Tim Lincecum Deal? Which team will sign former Cy Young Award winner, Tim Lincecum? It is a question many baseball fans have been pondering for weeks. It looks like we could have an answer very soon. It was reported a few days ago that Lincecum signed with the Los Angeles Angels, but there is no finalized answer quite yet. The deal is pending a physical, but it has been nearly three days since hearing any verdict of the final decision. 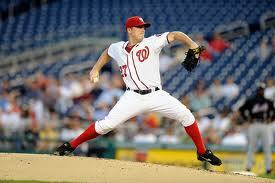 Time For the Nationals to Shut Down Jordan Zimmermann: Why Stop at Strasburg? Jonathan Hacohen: Before fans of the Nationals start to write any angry comments in respect of this article, please do me one favor. Stop. Read the article in its entirety and then pass judgement. That’s the least I can ask from each of you. Now that being said, I have a bone to pick with the Nationals. While I love the game with a passion, I also need to separate the fan in me from the writer. When it comes to the topic of Stephen Strasburg, I honestly have a hard time doing that. Shutting down Stephen Strasburg to me is like ripping up the winning lottery ticket. You just don’t do it. Too many stars have aligned this season for the Nationals, to have the season put into possible jeopardy due to a decision that could have been avoided. Putting it bluntly- Stephen Strasburg should be pitching right now. To the end of the season. And throughout the playoffs. You just don’t take out your ace when you don’t need to. What to Expect from Tim Lincecum in the Second Half: The Return of the Giants Ace to Form? Sam Evans: Tim Lincecum has been proving doubters wrong his whole life. 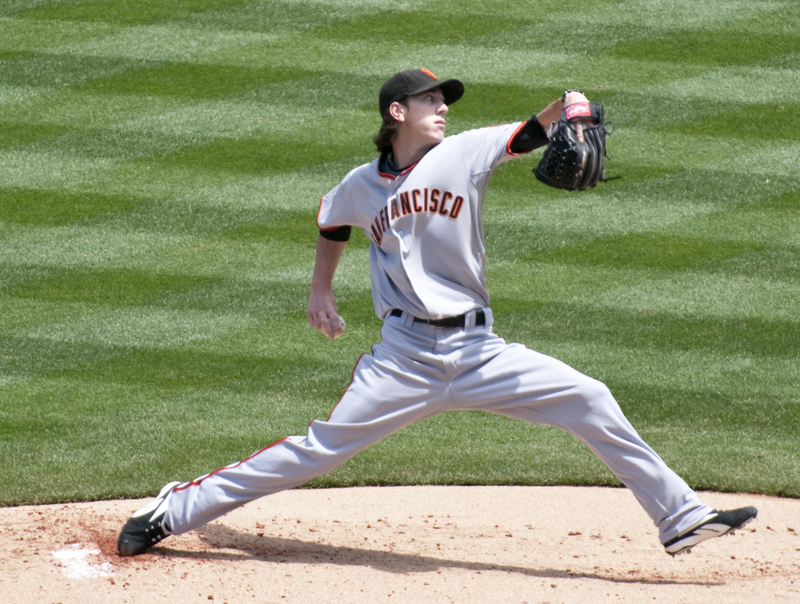 Despite his small frame, Lincecum has managed to win the Golden Spikes award and two N.L. Cy Young awards. However, in 2012 Lincecum hasn’t looked like the same pitcher. 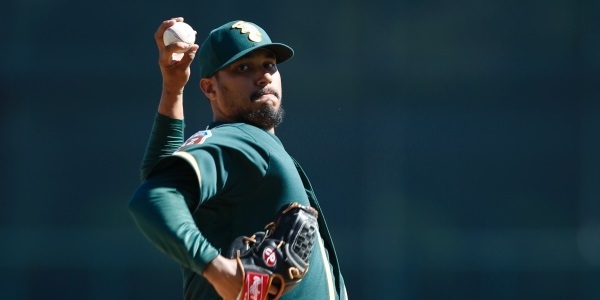 He has not only lost velocity on his fastball, but his numbers across the board are not what we expected from one of the best pitchers in the game. It’s hard to conclude what has caused Lincecum to struggle in his first fifteen starts. But the question on everyone’s mind is: what is next for Lincecum? Buster Posey Out for the Season: Time for a Rule Change? On the Reports, we will be occasionally featuring an up-and-coming baseball writer that has come to our attention and share their work with you, the readers. Part of our mandate at MLB reports is to provide the best baseball coverage and analysis in the business. MLB reports ultimately is designed to expose our readers to the world of baseball and the stories, facts, insights and profiles behind it. In order to meet this goal, we would like to give exciting young writers the chance to showcase their talents and provide a fresh pool of ideas to our site. In today’s feature, we are excited to have Brian Lozier as our guest writer with his post on the Buster Posey injury. Brian’s topic was to look at the Posey injury and whether a rule change is required in baseball. Enjoy! 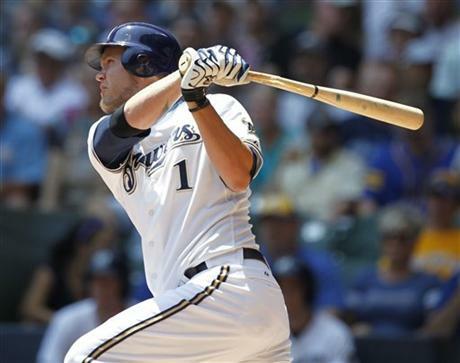 Brian Lozier (Guest Writer for MLB Reports): Injuries are another way of saying “Unfortunate event”. Things that are literally out of the hands of the people involved. There is nothing there to prevent injuries, slow them or make what unfolded heal any faster. Nothing can change an injury after it occurs, so people try to take measures into their own hands and prevent future occurences from happening. But at what cost to the game do we try to prevent injuries from taking place? 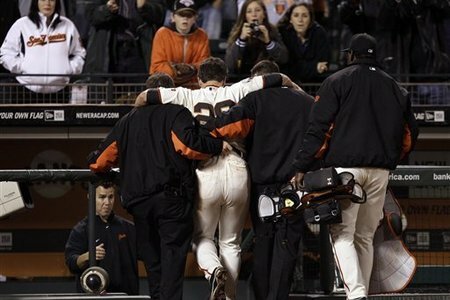 In the extra-inning thriller staged in AT&T Park in San Francisco this past Wednesday, former Rookie of the Year winning catcher Buster Posey suffered a broken leg and is out for the rest of the season and possibly the start of 2012 as well. A future All-Star candidate, Posey was run over by Scott Cousins of the Marlins, who scored the go-ahead run in the 12th inning. Posey, becoming an everyday catcher last season after being called up in May, played the role of protector of home plate on the play. Posey took his destiny and the future of his team in his hands by doing all that he could to fight for his team to pull out the win. The resulting cost though to the Giants organization was devastating. I can understand an agent’s view to wanting to keep players safe. I can see the importance of Major League Baseball taking measure to stop “senseless” injuries and preventing side-liners and career-ending plays. However, I have to draw the line when people ask to remove excitement from this great game. Train wrecks have been a part of baseball since the sport came into existence. 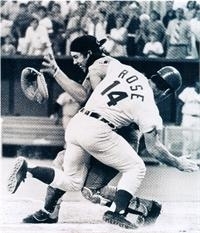 The most famous of which might have been the 1970 All-Star Game and the Pete Rose collision at the plate. Or perhaps the collision to end game 6 of the 2003 World Series. I will let you be the judge. Understanding one’s role and doing what it takes to win is a major part of being a Big-Leaguer. The speedster on each squad knows that it’s his job to steal bases. Consequence: Possible broken fingers. Outfielders on the other hand, are expected to catch balls on the fly. They might break a rib as a result, but it’s a part of their role. Pitchers go out knowing they could take a ball to the face or throw out an arm every time they step out onto a mound. But it’s what they do and is necessary for their respective teams to win. The above logic is no different when it is applied to the catcher. 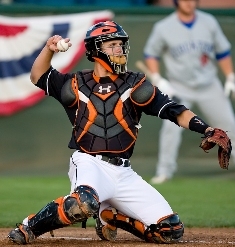 A catcher defensively at the end of the day must first and foremost, stop the baserunner. No question, no doubt. What would happen if the rule changed and home plate collisions were a thing of the past? No one knows for certain, but it’s almost safe to say it would turn home plate into another first base. This would result in every close play into a force out situation. This would be a nightmare for teams when facing a contact pitcher. The result would be raising concern in places where most teams whole have a sigh of relief. Imagine stopping the notion of a deep sac fly to score a winning run. Or worse, stopping the suicide squeeze. 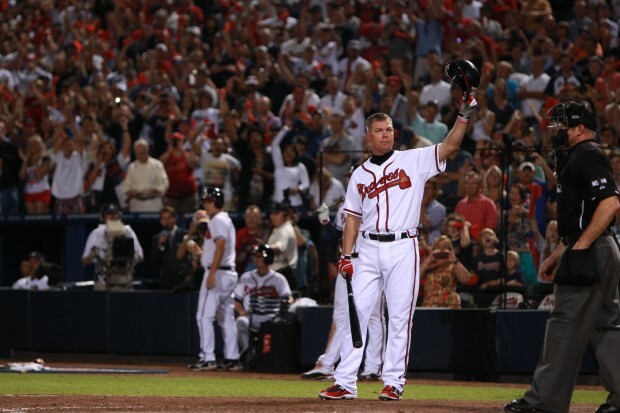 Baseball would almost become a game without a soul. I admire Jeff Barry for standing up for his client, I really do. In fact, more agents need to stand up for their players. I just wish it wasn’t at the expense of the game and the intensity of the sport that fans deserve. Why would anybody want to agree to this rule change? By abandoning home plate collisions, proponents of the rule change would be removing chance, excitement and thrill to the game of baseball. The clash of the titans at home plate during a game shows heart and guts to win a game which could possibly lead to a future World Series ring. Although not a perfect system which can result in the occasional injury, baseball needs to be played in the way it was meant to be. My baseball includes home plate collisions. It has been a part of the dynamic of baseball for all these years up to and including today and should continue to have a place in the sport for years to come.